aluminum alloy 2A12 and 6061 both belong to heat-treatable aluminum alloy, and they are difficult to distinguish from each other in appearance after heat treatment. Because of the huge difference in price between them, the difference is probably over 10000 yuan/ton. 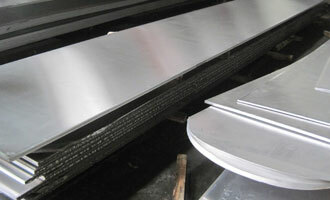 Therefore, many dealers in the market use 6061 aluminum plates to pretend to sell 2A12 aluminum plates. Hardness: after heat treatment, the hardness of 6061 aluminum plates is at 90HB, while 2A12 aluminum plates can reach around 120HB. The hardness difference between the two is large. If you have the brightness measuring equipment, the hardness can be measured. 2. Density: if you do not have a hardness tester, there is a simple method. The density of 6061 aluminum plates can only reach 2.7. Third, if in doubt, it can be detected by the third party. The content of each alloy element can be determined by the elemental analysis instrument and then the national standard alloy content can be obtained.